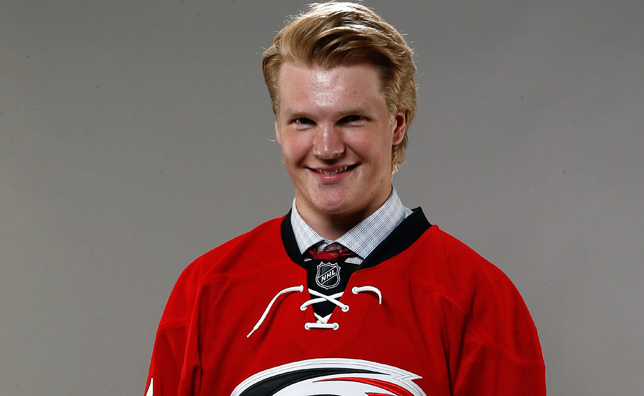 Josh Wesley, former Carolina Junior Hurricane and current OHL Plymouth Whalers defenseman, is participating in the NHL Scouting Combine running from May 26 through 31. The primary purpose of the Combine is to aid all NHL teams in the player selection process. NHL Central Scouting invited 119 players from North America and Europe. Josh, No. 111 on Central Scouting's final list of the top draft-eligible North American skaters, had two goals, nine points and 62 penalty minutes with Plymouth this past season. The prior season he played with the United States National Team Development Program Under-17 team. Josh was a member of the Junior Hurricanes 2010-2011 Bantam AAA and 2011-2012 Midget 16U AAA teams. The Junior Hurricanes organization congratulate and wish Josh the best at the Combine. See the comnplete list at Player Development Selections. 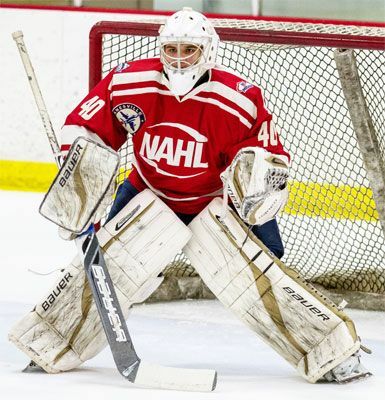 Logan Halladay- The USHL Bloomington Thunder have tendered goaltender, Logan Halladay. Halladay has committed to the University of Minnesota and is the 16th ranked goaltender by NHL Central Scouting! RYHA and the Junior Hurricanes are pleased to recognize the following Junior Hurricanes teams for winning their league and CHL season ending tournament. U18 A Red - Won season ending tournament - The team won a thrilling Championship game against the Charlotte Checkers, emerging with a 4-3 victory. The Junior Hurricanes surprised the favored Checkers with solid defensive effort, great goaltending, and timely offensive scoring. Congratulations to all 3 teams on behalf of the RYHA BOD. "Congratulations to '93, Forward, Jared Chinn on his commitment to Curry College for 2014-15. Chinn has been an Oiler for the better part of 2 seasons and returned in 2013-14 to serve as Co-Captain. Chinn, a native of Fort Bragg, NC will join teammate and friend Ryan Fitzgerald (Cary, NC) at Curry next season. Jared was a great addition to last year's team and has been the model of dedication and work ethic throughout his junior career. Congratulations to Jared and his family!" "Congratulations to '93, Forward, Ryan Fitzgerald from Cary, NC on his commitment to Curry College. The addition of Fitzgerald to our EHL roster this season was key component to the CT Oilers success both on and off the ice where he tallied (17G, 21A) in 38 games played. Congratulations to Fitzgerald and his family!" On behalf of the Jr Hurricanes, we wish to extend our congratulations to both players and their families. Yet another local goalie, Cameron Leonard, was recognized by WRAL Sports this past week on her attending the U14 National Camp over this past weekend. RYHA is very proud of Cameron and her accomplishments.